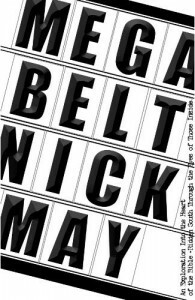 A couple months ago I received a copy of Mega Belt by Nick May to review for Energion Publications. May’s goal in this writing is to write a believable fictional account of a young man named Gil. Gil’s life reflects the experiences Mays’ has had in the Bible Belt and with Mega Churches. May uses irony and satire to engage his reader throughout his recounting of Gil’s memories. Each chapter in Mega Belt covers various life experiences an average churcher1 would have in the Bible Belt. The chapters cover things like our Easter Sunday traditions, Ice Cream socials, Youth Group, Mega Churches, hitting Rock Bottom, and more. If you are from the North (as I am) you may find it difficult to relate to many of Gil’s experiences. However, there are times when a lot of these traditions and questions posed by Gil will reflect some of your own experiences, regardless of where you call home. For me the first few chapters of this book were slow and fairly dry. It started to get more interesting around halfway through the book. I really felt like the last two chapters were the best chapters. May admits in his foreword that most of his readers will “hate how it ends.” [XI] Frankly, I thought the end was fine. I didn’t expect a huge conclusion to Gil’s thoughts, I felt like this book represented the beginning for Gil. I think most people on a journey with Jesus will share some of Gil’s frustrations and are probably around the same place spiritually that May left us with him. I give this book 3 out of 5 Circus Peanuts. It is a fairly short and easy read. I did not think there was much insight was given, but May was just trying to tell a story, so you shouldn’t expect much insight.